In this article we will focus on how to how to use LinqToSql classes to perform Insert,Update,Delete,Select operations on database tables using VB.NET. Linq to SQl provides runtime infrastructure for performing database operations such as Insert,Update,Delete, Select using objects. It automatically tracks changes in the background. In this article we will focus on how to how to use LinqToSql classes to perform Insert,Update,Delete,Select operations on database tables using VB.NET. Linq to SQl provides runtime infrastructure for performing database operations such as Insert,Update,Delete, Select using objects. It automatically tracks changes in the background. It is very easy to operations against the database. You need not know the sql query syntax because it creates the T-SQL statements internally using LINQ code you write in your code. For this demo I have created "EmployeeDB" database and added one table called Emp with the following schema. 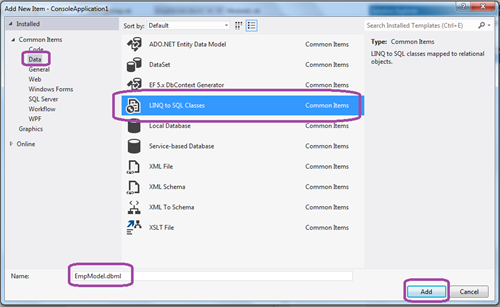 Right click Project in solution explorer-> Add New Item -> Select Data on the left hand side under common items -> Then select LINQ to SQL classes -> Give name "EmpModel.dbml". This creates LinqtoSQl class. Build the project -> Add a New class to the project and name it "ManageEmp.vb". In this class we are going to write code using LinqtoSQL to perform Insert,Update,Delete,Select,Select all operations. 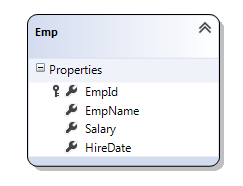 We will maintain EmpId as the primary key and Identity column to fetch,update and delete Emp details. Insert: InsertEmp method will be used to insert Emp details into the Emp table. Update:UpdateEmp method will be used to update Emp details into the Emp table. Delete:DeleteEmp method will be used to delete Emp details from the Emp table using the Emp Id field. Select: GetEmp method will be used to Get specific Emp details from the Emp table. SelectAll: GetAllEmp method will be used to Get all Emp details from the Emp table. In the above code model is an object of type "EmpModelDataContext". EmpModelDataContext class is generated by LinQtoSQL when we drag and drop the Emp table onto the LinqtoSQL designer. In the solution explorer click on ShowAllFiles icon to display the "EmpModel.designer.db" file Under EmpModel.dbml file. EmpModel.designer.db is automatically generated which contains the Emp entity which maps to the Emp table in the datbase. It contains the "EmpModelDataContext" class which contains the constructor which is used to connect the database. It also contains properties for every database field.In the App.config file a connection string is automatically added to connect to the EmployeeDB database. using EmpModelDataContext object reference we will perform all the database operations. model.Emps.InsertOnSubmit(e) method is used to insert emp instance into the Emp table using the InsertOnSubmit method. This method automatically generates the sql statement to perform insert on the Emp table. similarly SubmitChanges() method is used to save the changes to the database permanently. This change can be Insert/Update/Delete. DeleteOnSubmit(e) method is used to delete emp instance from the Emp table. model.Emps.ToArray() is used to retrieve all the records from the emp table and convert into an array. In the above query we are selecting employee with a specific EmpId which is equal to the empId variable value. SingleOrDefault method is used to retrieve a single record. It returns default value when there is no employee with empId value. If there are more than one Emp with a specific empId(which is never possible because EmpId is a a primary key column.) it throws exception. Now open the Module1.vb file from the solution explorer and in the main method write the below code. Main method is the method from where the execution starts.